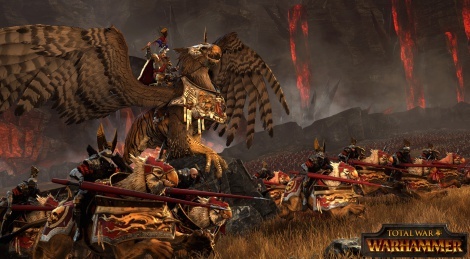 The Creative Assembly kindly sent us their dev walkthrough video of Total War: Warhammer in high quality. The The Battle of Black Fire Pass pre-alpha demo shows an epic quest battle bewteen the Empire led by Emperor Karl Franz and a Greenskin horde. Watch at up to 1080p 60fps with our HQ stream or download via torrent the 3.7Gb file. Awesome, I want this now! Well, the best thing about this video is the commentary, which is spoken in a charming British accent and worded in an elegantly informative way. All this massive battling, but no blood. I find that very strange... in cognitive dissonance way. Looks like there is some unique game play that can take place, but this battle is so scripted I can't really judge how the game will play live. 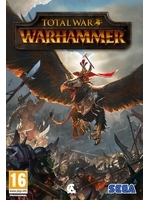 Blood is reserved for DLC, don't you know Creative Assembly? Yeah... I just keep pretending they'll not be greedy the next time, for some reason.